The first book I ever saw illustrated by Shaun Tan was The Rabbits. I sat on the library floor in the kids section for half an hour glued to the intricate, surreal images of ink, acrylic and coloured pencil that burst from its pages in a chaotic mess of machines and sailing ships. I decided this was a book, not for my children. 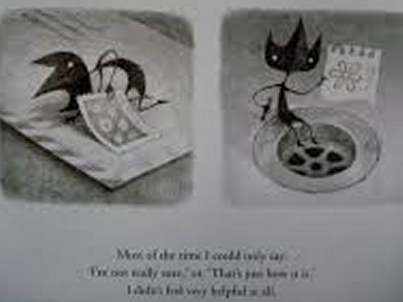 As my kids grew, so did my love affair with Shaun Tan. Although he is a writer and artist who produces picture books, his work is not children's literature as such. His work often focuses on loneliness, depression and inequality, themes not aimed at a children's market, but this is a book that I would recommend for older children, which I think they will love for a few reasons. 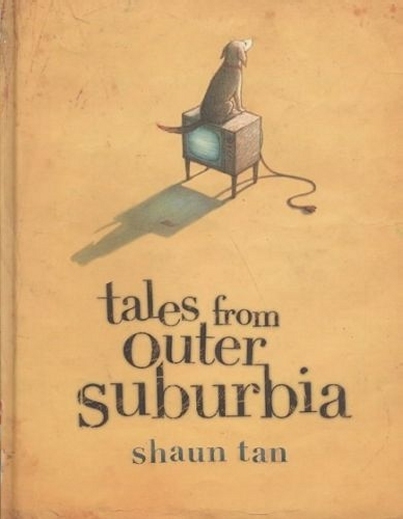 There are fifteen stories in Tales from Outer Suburbia. They are short little snippets of Tan's vivid imagination. Meetings with wild unfeasible creatures who have been planted in the humdrum of normality. Mostly these beings go about their own business without the slightest amount of self consciousness, but it is rather our human interactions with them that power each story. There is a hidden room, a nonchalant water buffalo directing children to their heart's desire, an array of neat little back gardens where adopted missiles are personalized and repurposed, and a map that leads to the edge of the Earth. Each narrative is its own little world, beautifully written and always surprising, often leaving the reader with more questions than answers. The artwork alone is worth the price of book. Full of whimsy and inventiveness, each one stands alone in its own style. There are finely executed pencil drawings, almost architectural with intricate details. Goache and acrylics that make me think of American artists like Edward Hopper and Charles Birchfield and others that look like ancient Japanese woodblocks. Children who love pictures can look at these and enjoy the diversity of styles, whilst budding artists instantly have a masterclass in the use of perspective, light and colour. Shaun Tan is a true artist in every sense of the word and every home should have a space upon its shelves for one of his surreal menageries.